The hardening of abortion into the pillars of political parties is showing fractures. Whether abortion is a human right belonging to a woman or a human right that belongs to the foetus used to be a philosophical and religious debate. Now it’s about politics. Republicans in the U.S. and a majority of conservatives in Canada are against abortion. Democrats and progressives in Canada support justifiable abortions. The abortion issue moved into political camps decades ago. The landmark decision of the U.S. Supreme Court in Roe v. Wade in 1973 declared that women had the right to choose an abortion. In response, anti-abortion groups began to rapidly mobilize and the “Human Life Amendment” was proposed. Abortion supporters argue that the when life is at stake, it’s the life of the mother which matters. In a reaction to the pro-life branding, abortion supporters had to come up with a strong brand of their own. “Pro-abortion” doesn’t quite do it because women don’t necessarily want to have an abortion –they just want to shed the yoke of paternalism that dictates what’s best for them. 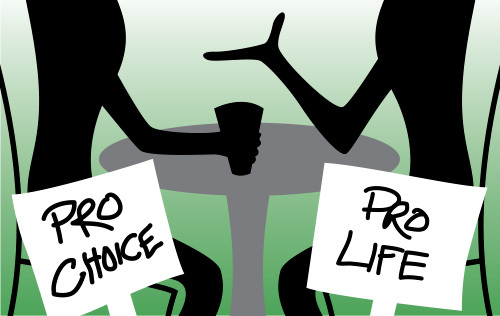 In response to the pro-life movement, supporters of abortion-as-an-option branded themselves as “pro-choice.” It’s a clever label in an age of commercialism because what consumer doesn’t want a choice? It also fits nicely into to the evolving image of women, and citizens in general, as individual agents rather than servants of the church and state. Women as free-thinking-citizens is a relatively new phenomena. Only a hundred years ago, women and children were considered the property of men and property doesn’t have an opinion worth considering. Thanks to U.S. President Trump, the tribalism of pro-life is beginning to fracture. Pro-life Republicans are conflicted by support of this misogynist president. Tess Clark grew up in Texas and always considered support for the Republican party her “Christian duty (Globe and Mail, December 7, 2018).” All of her life the issues of abortion and immigration made voting Republican her “Christian duty.” Clark recently told The New York Times that the pro-life movement should oppose hard-line treatment of border crossers. Clark was so sickened by Trump and his crackdown on Honduran families trying to enter the U.S. that she has redefined what it means to be pro-life. She now equates the separation of Honduran families with “a baby in its mother’s womb.” “I feel that being pro-life is being pro all life,” she said. Chelsey Yeaton, a student at a Christian college in Illinois and a member of Young Evangelicals for Climate Action, has also redefined what pro-life means to her in environmental terms. Whether to have an abortion or not is obviously not a trivial matter but the decision shouldn’t be based on politics. The expansion of the pro-life movement into other aspects of a healthy life is a welcome approach.